How does it feel when you wake up to an emergency plumbing issue in your home? Emergency issues often get both the home owner and every other resident of the home confused. For your Emergency Plumbing in Heathrow, you have no reason to panic. Always turn to A1 Plumbing Service to get all your emergency plumbing issues fixed. As soon as you discover any plumbing issue in your home – be it overflowing toilet, leaking pipe, clogged drainage, broken septic tank, and requires a quick fix, A1 Plumbing Service is always ready to help. We are distinguished Orlando Emergency Plumbers offering emergency plumbing services to residents of Heathrow, FL, and surrounding cities. We have all we have all it takes to offer a quick and effective fix to virtually each and every one of your emergency plumbing issues. At A1 Plumbing Service, our plumbing specialists are always ready to work with you and ensure that your emergency plumbing issues are fixed and restored to its proper working state. Our Orlando Plumbers are capable of handling emergency plumbing issues such as damaged faucet, broken toilet, busted pipe, clogged drainage system, and so on. After you must have discovered that your water heater, drainage system, septic systems, bath tub, or showers, are not functioning properly, A1 Plumbing Service is always ready to offer you a quick-fix. As one of the best Orlando Plumbers, we are always ready to take care of each and every one of your Emergency Plumbing in Orlando. Are you looking for 24 Hour Plumber Orlando? Always turn to A1 Plumbing Service. Even if it takes working around the clock to fix your plumbing issue, we are always ready to help. We will work round the clock, without stopping for a single minute, until we fix the issue and certify that your plumbing system is in proper working condition. 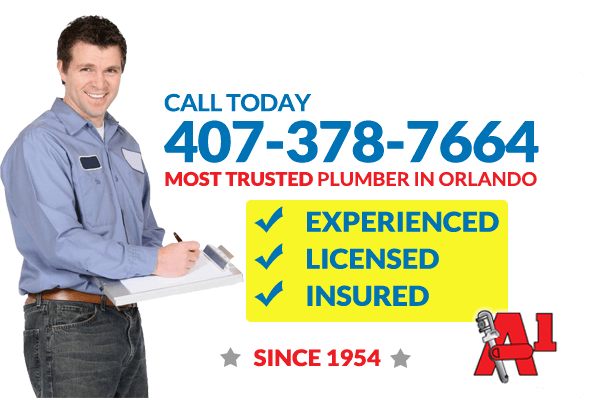 We are one of the reputable Orlando Plumbers you can always depend on. A1 Service Plumbing is proudly serving the plumbing needs of Heathrow, Florida. Rest assured that with A1 you will always have a licensed, experienced, insured, and professional plumber showing up to your home or office to perform all of your Heathrow plumbing needs. A1 will always stand behind their work and has been serving the community with friendly, prompt service since 1954. A1 has an A+ rating with the Better Business Bureau and 24 hours around the clock emergency service for the Orlando and Heathrow areas. A1 offers a wide range of services and repairs for residential and commercial customers. A1 guarantees customer satisfaction and always uses the highest quality replacement and repair parts, along with the most expert Orlando plumbers. A1 often runs a variety of promotional offers so you know you are getting the best service at the best price possible. A1 also installs and services water heaters from a variety of brands. Have a leak? Need Repiping? A1 Services can help. You can call A1 at any time for any of your emergency plumbing and water heater needs for any commercial or residential property. Just give us a call about the issue, and you can expect us at your residence within a short period.